We are located oceanfront, in the heart of the West Maui Resort Area. 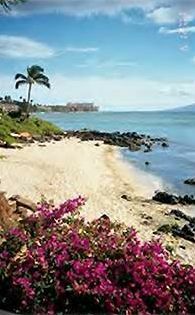 Halfway between Kaanapali and Kapalua and just ten minutes from Lahaina Town, the old whaling village and historical Royal capital of Hawaii, our condo comes complete with everything you need to make your vacation in paradise a thoroughly enjoyable experience. The little bluff overlooking the water is a favorite gathering area each evening to watch the spectacular sunsets behind Lanai, and if your timing is right you may even hear the trumpeting of the conch shell as the sun disappears from the horizon. We offer over 2 acres of lush tropical foliage and a small secluded beach. Ideal for sunbathing, snorkeling or just dipping your toes in the water. A picture perfect setting for weddings, honeymoons and reunions? Once you arrive, all that is between you and the ocean is the pool. Just steps from your private lanai you can take a dip before you start your day or unwind at the end of an activity packed adventure. Enjoy breathtaking views of the ocean and Molokai from the comfort of the lounge chairs while you relax with your morning coffee or an afternoon Mai Tai. Our one bedroom, one bath condo comes with all the amenities to make your time in paradise truly memorable. We provide Cable TV in the Living room and Bedroom, VCR, stereo, king size bed in the bedroom and queen size sleeper sofa in the living room. The newly remodeled kitchen comes fully equipped with glass top radiant range/oven, microwave, dishwasher, refrigerator, all dishes and utensils. Beach equipment, cooler and even a sand pail or two for making sandcastles. All you have to pack is your toothbrush and swim suit. Be prepared to fall in love with the lush setting and Maui. You will lose your heart to the Islands and like many of our guests, want to return each year. Nice place on the ocean front in Maui. It is nothing fancy but the bed was firm and the place was complete with dishes, towels and sheets. We had a bit of trouble with the WiFi password so the password might be better presented in the guidebook with the case sensitive letters identified. But nice place and good central position for Kaanapali, Lahaina and Kapalua exploring. We loved everything about this place!! We will for sure be back! thank you so much for the lovely words and the 5 star rating. I am happy to read that you enjoyed your stay would like to stay with us again in the future. We look forward to your return. Great location, very comfortable and easy. We had a great stay at Polynesian Shores. The apt was very comfortable and the views from the back were stunning. Its in a great location in West Maui- a short drive from lots of restaurants. We had a great time! Great one bed room condo steps away from the lava rock shoreline. Facing west, it was fun to watch the sunset every night. I especially loved checking on the sea turtles soaking in the sun along the shore. Beth, the owner, is great to work with. Feels like family. The condo has everything you need to cook or just enjoy. Walking distance to grocery, coffe shops and restaurants made it super convenient. I only needed my car to explore the rest of the island. I will be back! Thank you for the lovely review. I am glad to read that you enjoyed your stay, even considering a teensy bruch with Hurricane Lane. I do hope you will come back and see us in the future, I look forward to your stay. Polynesian Shores is very quiet and relaxing complex. The amenities were as described. When we arrived there was juice and banana bead, a nice touch after a long flight. Parking is great and close to unit. They have a new maintenance guy who seems to be doing a great job and was continuously cleaning grills, planting, paining, etc. I even saw him cleaning the pool at 5:30am when we woke up to do the road to Hana. Beth, was incredibly responsive, usually in hours, to any queries I had before arriving. We did not have to touch base when we were there as everything went as planned and described. The place is not overly updated per sae but is clean and well maintained. Similar to other places we have stayed. There are beach chairs, two snorkeling sets, a fishing rod, soft and hard coolers that can be used. Unfortunately they were doing a few ground repairs when were there so there was a pile of dirt and safety cones in our direct view but these things happen and need to be done. It happens everywhere - maintenance. The beach has also apparently washed away this winter so there is no direct access to get in the water ( I noticed this in many areas across the island which used to have more beach area - even Black Rock seemed to have less beach than last year. Hopefully the tide brings the beaches back. Tons of turtles right in from of the resort. One morning I believe there must have been a few dozen of them playing around. I counted 7 in one wave so they were plentiful. Overall a friendly relaxing complex with a responsive owner who is vested in keeping the unit in good shape and ensuring good experiences. I would not hesitate in letting others know about this place. Aloha Rod Thank you for the lovely review. I am delighted to read that you enjoyed the turtles. They truly are a spectacular to watch playing and sunning themselves. Also happy to read that you enjoyed the property and the unit and you would recommend to others. I would be delighted to have you return for a stay in the future. Great young family vacation getaway. Downstairs unit, swimming pool and partial ocean view. Clean unit offered all basic amenities. Swimming pool is small, which made it ideal for very young families. Christmas 2017 were filled with many many young families,; in which making sleeping-in impossible with the little feet running back and forth and furnitures dragged around from the 2nd floor occupiers, at the crack of dawn. Next door unit is occupied by primary residents. Friendly and always home. So we felt obliged to be mindful with our noise. Property sits on rugged rocky ocean front. Do not expect to see or have access to a Sandy Beach from this property. Property is very close to Kapalua Air Field, a very small airfield for Mokulele Airlines. Gorgeous view of the island of Lanai. Incredible sunsets. Perfect temperature. I am happy to read you enjoyed your vacation and Christmas at the property. Unfortunately like most properties on the West side we have been experiencing a wash away of the beach. This happens every now and then and we just decide it was time for the sand to take a vacation at Molokai. it will return eventually. Also happy to read you were able to enjoy the beautiful sunsets. I do hope you will consider visiting and staying with us again in the future. Note: The nightly rate for Christmas and New Year's increases to $185.00 per night.